The Seventh Judicial District Commission on Judicial Performance, by a unanimous vote (with one member absent and one vacancy), recommends Judge Scott Timothy Erickson BE RETAINED. 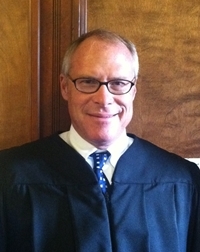 Judge Erickson received an undergraduate degree from North Park College in Illinois in 1983. He received his law degree from the University of Denver in 1988. Judge Erickson was appointed as a county court judge in July in 2012. Judge Erickson takes an interest in his community and, among other things, has conducted training seminars for organizations in the community. He also has prior experience as a municipal court judge. The Commission reviewed his decisions, reviewed the survey results, conducted a personal interview, interviewed the Chief Judge, the District Attorney and the Public Defender and reviewed Judge Erickson’s written self-evaluation. Both attorneys and non-attorneys were surveyed regarding Judge Erickson’s performance. Of the attorneys responding to the survey 89% recommended to retain and 11% not to retain. Of the non-attorneys responding to the survey 74% recommended to retain, 15% not to retain, and 11% made no recommendation regarding retention. However, given the small number of responses from both groups, the survey results may not be significant. Judge Erickson’s workload consists of 25% civil, 10% criminal, 40% misdemeanor, 10% traffic, 5% traffic infractions, and 10% small claims. The commission noted the amount of respect he holds for every person before him. Overall, the commission unanimously voted that he be retained.